The auctioning system of our platform is evolving! 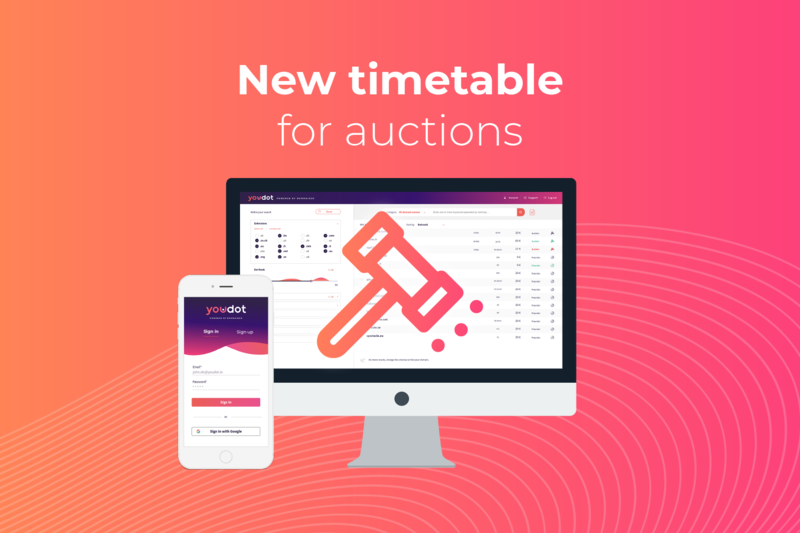 As you might have read this week, the timetable for auctions on Youdot has changed to focus on two specific days of the week. Starting this week, all auctions will now end on Mondays or Thursdays. This brand new calendar also includes livestreams (in French), during which Delphine, Julien and Jonathan will tell you everything you need to know about the best auctions of the day. 👌😉 Meet them at 2:50PM (UTC+1) to follow the end of the daily auctions. Our goal is to meet our community twice a week and share the best tips with you about expired domain names. If you’re subscribed to our newsletter, you will also receive two emails each week giving you the best ongoing auctions according to various criterias. The list notably includes a selection of the top domain names depending on several SEO indicators featured on the platform, but also specific elements such as the number of bids that have been placed on a specific auction.